“Good morning, Bohemians!” So, the jubilant cry would have been heard in Paris, circa 1853. It can still be heard today from down the street where I live in Seattle and all across the globe. I am a bohemian. 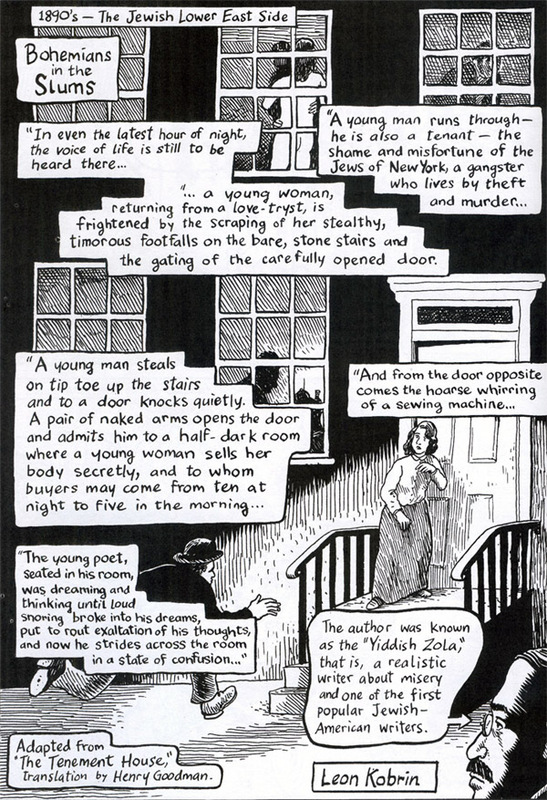 I’ve always identified as such as a writer, artist, and cartoonist. But what does it really mean and how did this concept come to be? 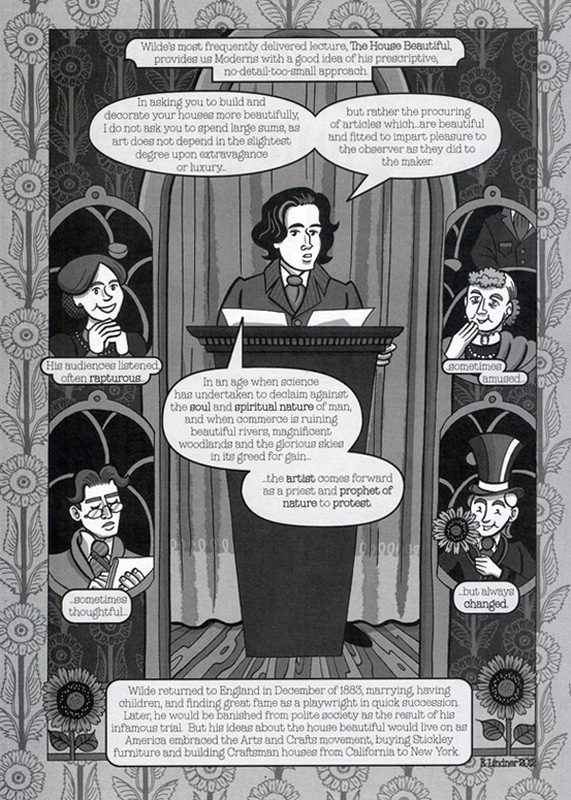 In the new comics anthology, “Bohemians: A Graphic History,” edited by Paul Buhle and David Berger, we get a full history. These short works are created by some of today’s most accomplished cartoonists, who also happen to be some of the best examples you will find of contemporary bohemians. Bohemians are not hipsters, although there is plenty of crossover. The idea, or ideal, runs deeper. But it’s complicated. What this book makes clear is that, to be a true bohemian, it is way of life, and yet, everyone is welcome: outcasts, dilettantes, and deviants can march right along with writers, artists, and revolutionaries. There was a real Bohemia, part of what is now the Czech Republic. This region was misidentified as the source of the Roma people and culture. The Roma were known as gypsies and Hitler came close to exterminating them. The Roma were associated, on stage and literature, with Romanticism. They were, indeed, the original Bohemians, the carefree artists in somewhat opposition to the earnest and conventional bourgeoisie. This term would come to identify a whole subculture. In Paris, it was the bohemians that would rally in support of the worker’s struggle in the 19th century. In America, the bohemian spirit took root in many ways. One leading force was Walt Whitman. 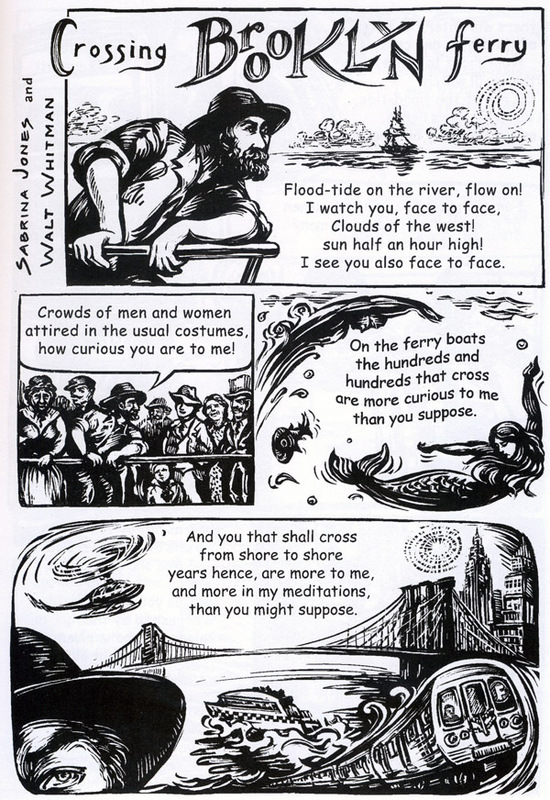 One of the most engaging contributions to this anthology is a profile of Whitman as a young man by Sabrina Jones entitled, “First Impressions.” That is followed by a real treat, her illustration of Whitman’s “Crossing Brooklyn Ferry,” that mixes the eternal with the contemporary. The ubran utopia dreamt of by Walt Whitman would give way to colossal change: a civil war, industrialization, and rapid overdevelopment. But the bohemian spirit pressed on. In “Oscar Wilde in America,” Ellen Lindner recounts Oscar Wilde’s 1882 lecture tour in America in support of the Arts and Crafts movement. We find a serious man of letters in contrast to the popular caricature of an effeminate dandy. It’s interesting to see this work in comics address the misconception that was perpetuated by a different strain of cartoon art. It is a heady mix of people and circumstances that make up those in the bohemian orbit. In “Those Bohemian Immigrants: Germans and Jews,” David Lasky provides a look at the first wave of Jewish-American writers, including Leon Korbin, Joseph Bovshover, and Abraham Cahan. Lasky, in his distinctive style, evokes a haunting melancholy that is quite fitting. 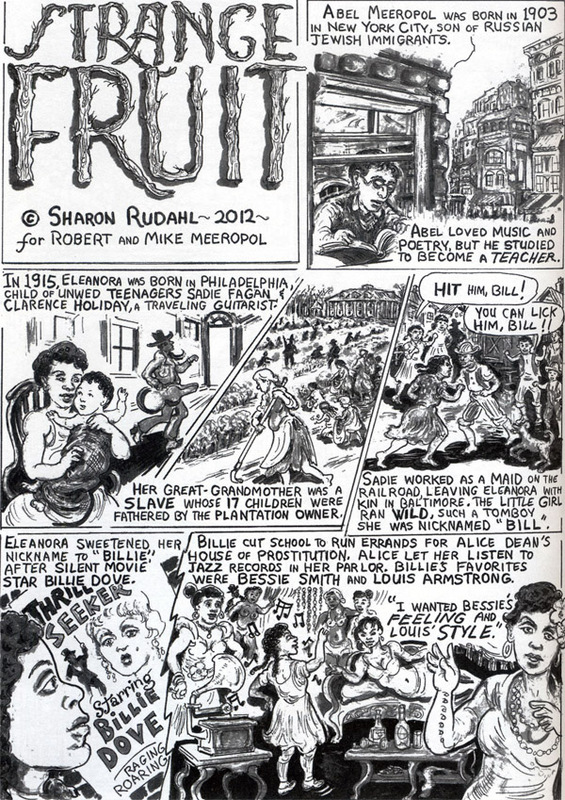 Another wonderful artist in this anthology is Sharon Rudahl who contributes three works, “The Amazing Tale of Victoria Woodhull,” “Trilbymania,” and “Strange Fruit.” The first is a fascinating profile. The second is an amusing look back at an early attempt by the middle class to hop on the bohemian bandwagon. And the last is quite the show stopper. “Strange Fruit” chronicles the life of Billie Holiday and how it intersected with the life of Abel Meeropol. We see how Holiday overcame severe adversity to become a notable jazz singer. And we see how Abel Meeropol evolved from an academic to a popular songwriter. It was his moving poem against lynching that he set to music and was to come to the attention of Holiday. After some persuasion by club owner Barney Josephson, Holiday agreed to sing the song and made history in the process. There is much more to this story and you’ll want to see for yourself. With each new generation, the hallmarks of being a bohemian (experimentation, free love, protest) are absorbed and pretty much taken for granted. And what about all the people who are not really bohemian but who are out slumming, pretending to be hip, not even true hipsters? Would bohemians from the past feel slighted in any way? No, not in the least. In their irreverent and inclusive way, they would be pleased or not make a fuss. This book shares in that spirit and should inspire every reader to live up to being the best bohemian they can be. 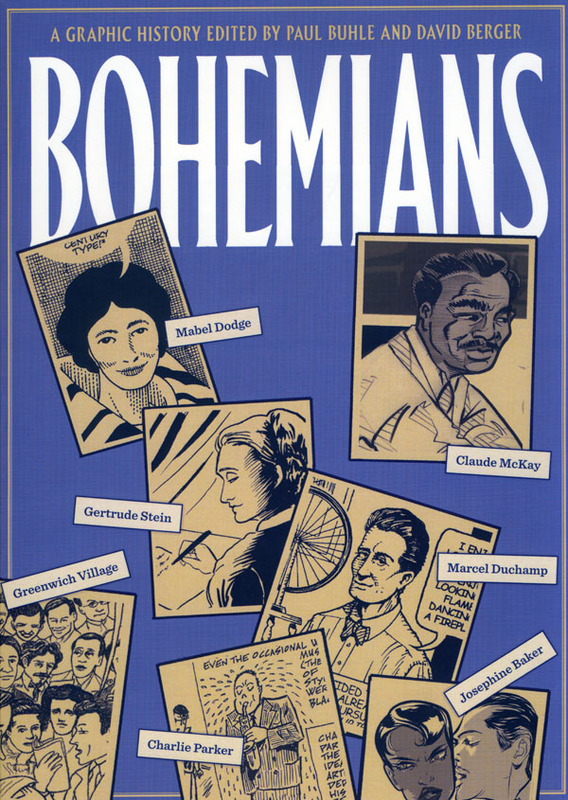 “Bohemians” is a 304 page trade paperback, published by Verso Books, and available as of April 15, 2014. You can get your copy, print or Kindle, at Amazon here.